Found a SRT4 in decent condition. Sold my Cobalt SS Turbo a few years ago and miss boost so I picked up this car. Will post pictures once I figure out how lol. welcome! cant wait to see it! You'll find a very similar performance feel to this car as your Cobalt. I drove both the SC and TC versions. The SC version felt "out of breath" as you started to get into 3rd gear. Switching that out with a turbo fixed that issue in a hurry. Ive never driven an LSJ but I do love the sound of the M62. I hate to say it but I would choose the LNF SS/TC over an SRT4....but I wanted to try something new so here I am. I love the sound of a SRT4 over a SS/TC though, both exhaust and BOV. K&N Typhoon intake on a SS/TC was okay. Shifting a SRT4 is just horrible! I cant wait to upgrade the fork...I hear it makes a world of a difference. Yeah, GM learned alot from PVO when they shamelessly copied the whole idea of a high performance FWD subcompact from PVO aka SRT. 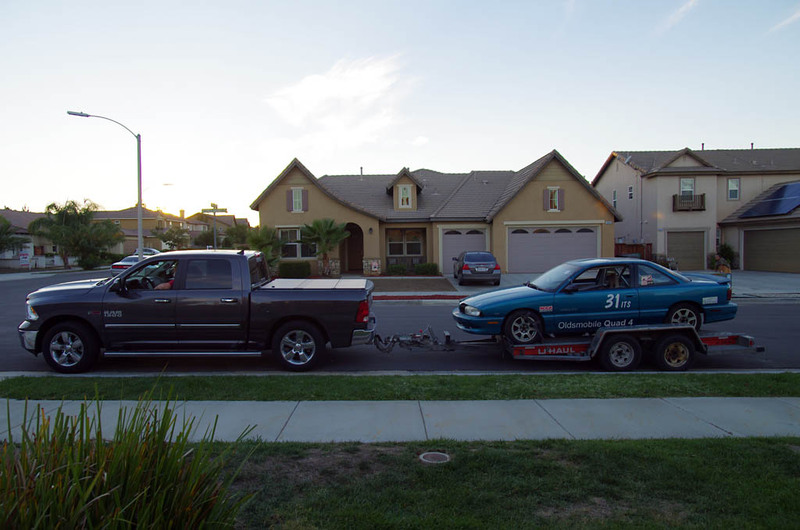 They even stole one of our best drivers, Jeff Lepper, who was a good friend and who installed most of my S3 turbo - and fumigated my garage! But in the end, it's more disappointing what happened after both SRT and GM fell apart after 2008 or so. I can't think of a decent FWD subcompact nowadays let alone a high performance one. You will enjoy your "new SRT-4" be conservative with the mods. Nothing worse than see a new member who "tunes" their car and then talks about parting it out after a few weeks because it's "crappy". Last edited by Simon.Starkie; 04-12-2019 at 03:13 PM. Thanks man, I agree GM had the opportunity to see what the SRT4 lacked thus allowing them to upgrade them into the LNF platform. Back when the SRT-4 was a week old. 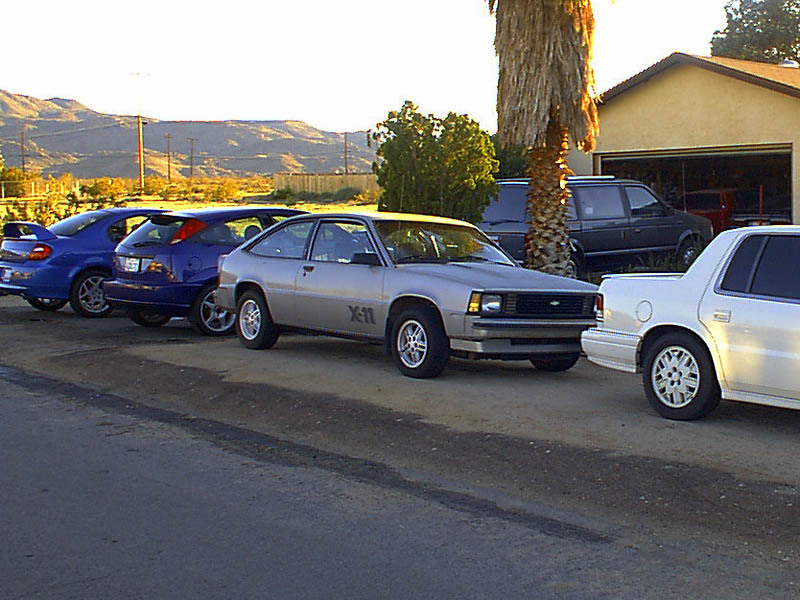 Oh yeah, GM also factory backed some other successful World Challenge cars in the day too. 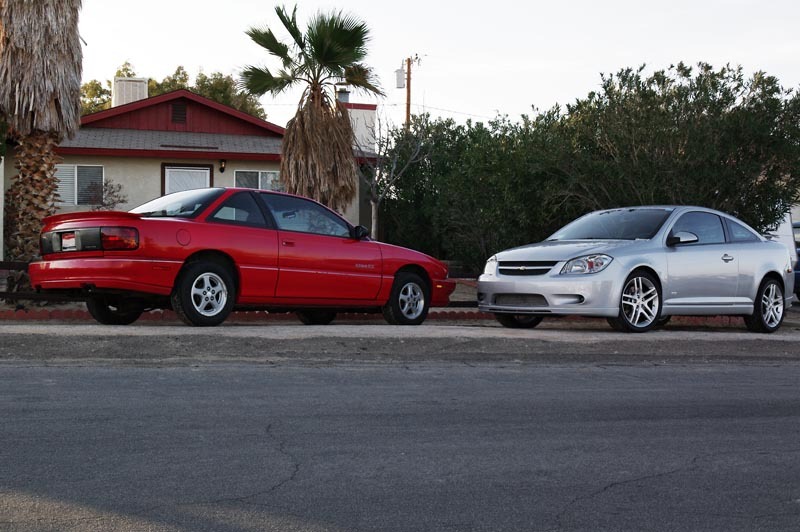 I still have my '08 Cobalt SS Turbo and my '04 Neon SRT-4 (and my X-11 and SCX W-41). There's likely a review/comparison of the Cobalt floating around the forums from back in the day. They both have strengths and certain areas of weakness that crop up at certain levels of heavy modification. A stock Neon has a little more character and will bite you with the handling when pushed too far. The Cobalt has the same cheap plastics the press loved to hate but was more refined, quicker and had much better ride/handling (although an ACR equipped SRT-4 corrected a lot of the stock SRT-4 deficiencies). You should have fun. While the Neon has held value reasonable well, the Cobalt hasn't done so great, which means you can pick up clean examples for a great price too. There's still a lot of modifications and decent aftermarket support for the Delta platform cars and Ecotec engines. Is that the back end of a white Spirit R/T I see there? Wow, I thought the X-11 was just a decal. Thanks for the edumacation. Difficult to think of a Citation as a "sport compact" though. I've only ever owned two Chevy's. A black 62 Corvair which was cool because it had a Chiquita banana sticker on the steering wheel center. A red 93 Z28 which I named Christine because she was definitely possessed. What about Ford? I always liked the Lotus Cortina and then the Cosworth Cierra was .... well ... not available on this side of the pond except as a Mercur XR4TI. And of course, the Darth Vader car - GNX. In the end, for me, that 68 MGB with the electronic Borg Warner overdrive, although bit slow, sounded so cool with it's rorty exhaust when I drove it from LA to the Grand Canyon in '73. That road between Phoenix and Flagstaff remains as one of my all time favorites for a run at a decent rate of speed - from blazin desert to alpine rain in less than a couple of hours. The same character as my 03 SRT-4 in fact. Same colour too, Yellow, which is the fastest colour. As evidenced by too many speeding tickets in both cars! Last edited by Simon.Starkie; 04-16-2019 at 12:10 AM. Im digging that W41 with SS/TC picture. I need those W41 camshafts and chip! That's the one I briefly had in high school, had to sell before graduating due to insurance eventually figured out what it was, then bought back five-plus years later after accidentally running across the then-owner on the old RT Mailing List (RMTL). Unfortunately it was totaled by a drunk driver slamming into it while parked in front of my house not long after that picture, but I still have my red '91 Spirit R/T that I'm the second owner. 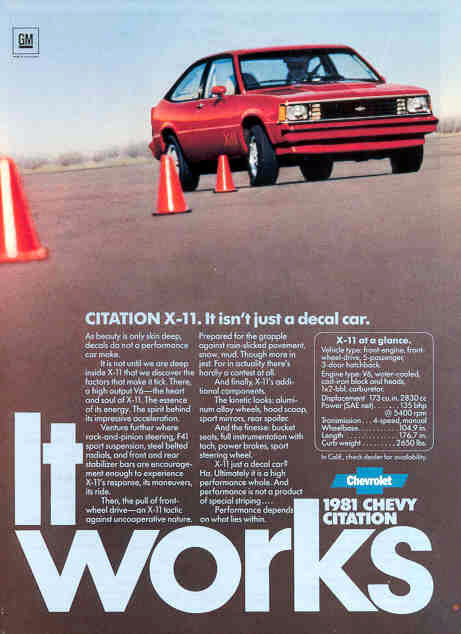 The X-11 did win two years of SCCA Showroom Stock B, the high output V6 was only down 15hp to the base 305 (5.0L) V8 in 1981, they could pull .85g on the skidpad (on early '80s 14" Goodyear Eagle GTs) and it wasn't a lot slower through the quarter-mile than the smog equipment-strangled Corvette. If you followed some or his amateur racing or are familiar with some of GM's performance cars, especially into the early and late 2000s, the X-11 was one of John Heinricy's first big projects he was in charge of at GM (his personal site here). Related to the original poster, the Cobalt SS Turbo happened to be one of his last projects before he retired. Thanks. That red one has a reman non-HO 150hp Quad 4 that was put in by a GM tech that previously owned the car. I think he said the owner before him pulled the HO W41 engine for some other project. I commuted in it for a while and think the chassis is close to a quarter-million miles now. I do have some spares but nothing I'm look to part. All the special stuff is actually on my other '93 SCX W41 that I picked up about 10 years ago. The previous owner built it up with most of the special Olds Quad 4 upgrades from the Rocketparts catalog and chassis parts from one of the World Challenge cars (Torsen diff, baffled fuel tank, etc.). Well if you find some W41 Cams and chip and are willing to spare let me know! Cool cars bro! I had a Spirit along time ago.....no idea if it was a R/T....might have been and I would have never known! Thanks for the info on John....that's cool stuff.